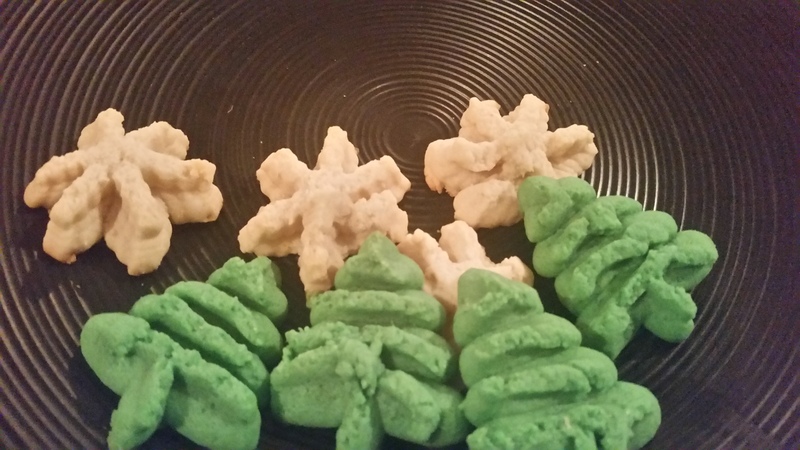 Christmas Spritz Cookies – What's for Dinner Moms? I love, love, love Christmas time! We start baking right around Thanksgiving and make cookies right up until Christmas Eve when we make our families Apple Kuchen. I made these with my mother when I was little. Our cookie press was a bit different from the one I have now but they still have the stars, trees, and bar shapes that we love. These are real simple cookies that you can easily customize with your choice of food coloring, sprinkles, dip them in chocolate, and use different disks in your cookie press. These were the same simple cookies I remember. Tasty with a nice almond flavor. You can use vanilla extract, lemon extract, etc… it is all up to you! We needed to add a bit more flour than the recipe called for as we had been baking and our house was a bit warm and humid. You want the dough to be stiff enough to cut when you pull up on your cookie press but not too stiff that it doesn’t press. Try a cookie or two and adjust flour to your dough as needed. In a large bowl mix together butter, cream cheese, sugar, and salt until light and fluffy. Add in flour and stir until combined. If desired divide dough into three bowls and add food coloring as desired. Place about 1/3 of the dough into the press and make cookies approximately 2″ apart. Bake until edges are browning. Allow to rest 5 minutes on cookie sheet before moving to a cooling rack. Store in covered container up to 4 days or freeze up to two months. Yes! Need to pull out the old-fashioned favorites every once in a while. Beautiful Christmas cookies that I would love to offer to kids in my neighborhood during Christmas ! Thank you! Hope they like them. We need to make these! Thanks for the recipe! I love Christmas too, we even celebrate it in July. Thanks for this yummy recipe, can’t wait to make it with my family. ❤ Hope you like it! I remember making spritz cookies. They’re so cute. Thank you! It was fun to make them with my kids like I did when I was little. The smell of Christmas cookies baking…the best!! Thank you, Sylvester! You are so right! You’re welcome, Marci! Have a great week! These cookies sound great, Marci. I am saving this recipe for future use. Thank you! It is definitely an oldie but a goodie! Oh will try these. thanks. Sometime my recipe comes two greesy and I need to freeze it. any tips? Are your butter and or cream cheese too soft? Also the humidity in your area and house can effect your dough. oh how should the butter and cream cheese bee? Cold from the fridge right? Slightly softened so you can work it into the sugar. You should be able to slightly press on it and have some resistance against your finger not be able to press it down to the middle easily. Okay made the cookies and I couldn’t use the press but I finally think it’s because I can’t use margarine or I can’t believe it’s not butter. These cookies need butter. For letting me know that they didn’t work for you. So sorry. They all sound amazing! Merry Christmas to you too!